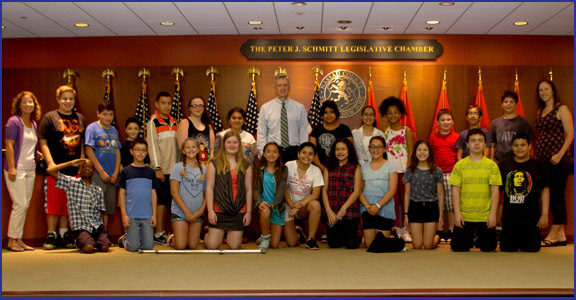 Legislator Richard J. Nicolello recently met with 6th graders from Mineola Middle School at his Legislature office in the renovated “Old Courthouse” Theodore Roosevelt Executive & Legislative Building in Mineola. Legislator Nicolello and the students engaged in a lively discussion about county government and the way laws are created. After touring the Legislative Building, the students visited the Nassau County Police Department Headquarters next door. Detective Garcia and Officer Walters took the students on an informative tour of the Police Museum and Ceremonial Chambers.